Futures traders made a classic mistake in 2018. It happened in the world's most important commodity market... the oil market. The excitement of booming oil prices took control. Investors expected bigger and bigger gains. Predictions of $100 a barrel seemed rational... not kooky. Futures traders saw it as an obvious trade. Bets on higher oil prices reached all-time highs. 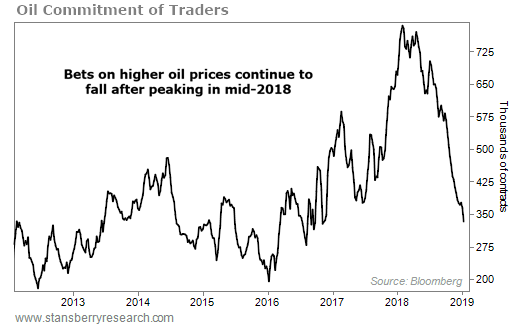 Never in history were investors more bullish on oil than they were in mid-2018. Bets on higher oil prices have fallen to a multiyear low. And while that might seem like the kind of contrarian buying opportunity we look for, history says the bottom in oil isn't here just yet. The reason for last year's massive oil price fluctuations comes down to a simple recipe. It's based on human emotion. Investors tend to flock into popular opportunities. The fear of missing out takes over, and that pushes trades to irrational limits. But it also leads to predictable outcomes. This is why, when futures traders all make the same bet in one direction, the opposite tends to occur. We can see this through the Commitment of Traders (COT) report for oil. It's a weekly report that shows us what futures traders are doing in the oil market. In May, investors reached all-time bullish levels on oil. There was nobody left to drive the price higher. This decline took a while to kick off after the record optimism in May. But once it did, the fall was brutal. Many futures traders closed their positions as the pain went on. That's how these situations normally play out... Folks pile in near the top of the big run higher, and they get crushed on the way down. While this is a good sign the trade is cooling off, the selling likely isn't over. As you can see in the chart above, we're now in "no man's land" for oil sentiment. Futures traders aren't all betting on lower oil prices – yet. Some of them are still convinced higher prices will return. In the meantime, those holding and hoping for oil to rally again could cave under more pressure. And that could ultimately send oil prices even lower from here. We probably won't see the bottom until sentiment hits extreme bearish levels. We're getting closer, but we're not there yet. The COT still needs to drop dramatically before sentiment causes a turning point in the oil market. Until then, don't try to "catch a falling knife" by betting on higher prices too soon. 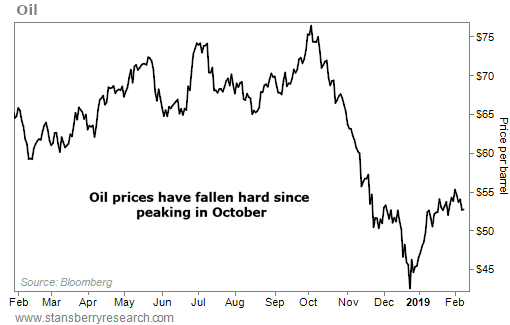 We will likely see lower oil prices before the ultimate bottom. "This is a trend I expect to continue this year," Steve says. "This asset tends to thrive when investors are scared. And folks are darn scared today." Read more about an opportunity he's seeing in another sector as sentiment turns – and one company poised to take advantage – right here. "You won't see it in the headlines," Brett writes. "No one cares... And that's actually a good thing." Another commodity is quietly setting up to be a major winner in 2019. Learn more here: A 'Silent Boom' Is Starting Outside the Stock Market. We’re talking about the New York Times (NYT). 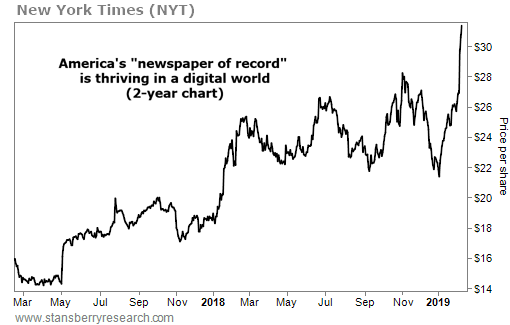 The $5 billion publisher is also known as America’s “newspaper of record.” To meet readers where they are, the Times is focusing on digital subscriptions. Last year, it grew its digital subscriber list to nearly 3.4 million… up 27% from the year before. And thanks to this strong growth, the company now hopes to hit 10 million subscribers by 2025.